Better Late Than Never: #NSS17 Favorites! Yes, I know. The National Stationery Show 2017 happened ages ago (around five months to be exact). Well, I finally gathered all my favorite stationery brands together, and found the time to photograph and sit down to type up this post! NSS17 was definitely smaller than the previous year, but that's okay (because less walking for me). Being a creative, it's important to support other creatives around you. I've always been a fan of the "community over competition" motto, and it's definitely help me as a person, and a calligrapher (if you didn't know, now you know). I want to share some amazing brands that I've connected with after NSS17 that are doing some awesome creative things. Each of these brands definitely has their own niche, and I hope you love them as well. Put the phone down, and send more snail mail! Looking for beautifully illustrated cards? Amy Heitman has got your back. You can tell a lot of heart and soul went into the design of these beauties, and the florals on these cards are just stunning. Oh, and the puns are greatly appreciated. Looking for some foil stamped goodness? Look no further than Australia-based, Frankie's Girl. They have everything you're looking for in foil stamped cards (silver, gold, copper, and rose gold). Go and charm a loved one with one of these dashing cards. Looking for something cheeky? We all know that I've been a fan of ilootpaperie for over a year now. This sister-owned company makes me smile, and their cards do the same. You need to check out their new foodie die-cut cards filled with puns, cuteness, and creativity. Love you, Alice and Doris! Looking for something cute and quirky? Inclosed Letterpress Co. has the cutest cards, hands-down. I love the use of "Tiffany blue" on these cards. 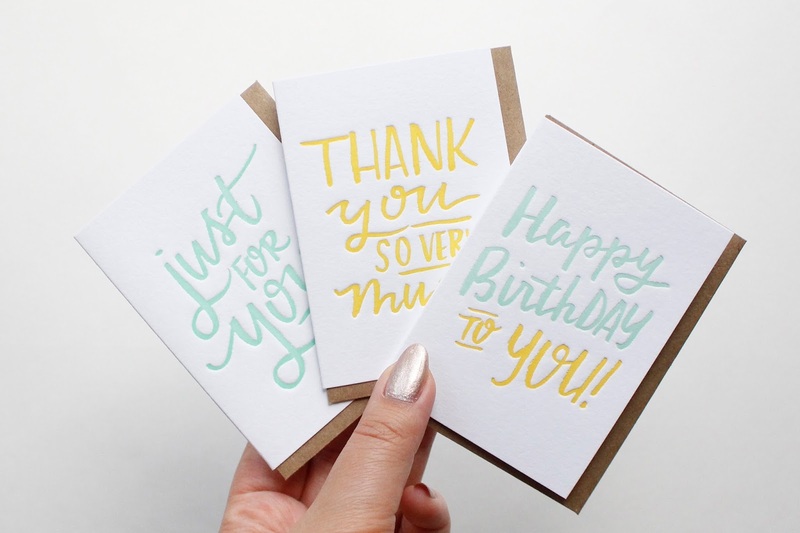 Letterpressed with fun illustrations and flowly script, these cards will never disappoint! Looking for something super fun? These colorful letterpressed cards from Parrott Design Studio are super playful. I love all the interesting shapes and the squiggly designs on each card. The color themes make each card free-spirited. Absolutely love! Looking for the wittiest statements? Don't overlook Pinwheel Print Shop - their cards exhale the brutal truth (in a funny way). Give your loved ones (and yourself) a laugh with these statement greeting cards. I can spot a Pinwheel Print Shop card a mile away because of their unique hand-lettering! Looking for something simple but chic? These delicate cards are great for any occasion, and I love how they have cards for "just because" moments as well. Sweet sayings and simple patterns are definitely up my alley. Cards Shown: Maid of Honor / Bridesmaid Blossoms / Wedding Day Blossoms / Mr. and Mrs. Looking for something that screams "wedding bells"? Underwood Letterpress has just what you're looking for. Their letterpressed cards are fun with hints of foil here and there. And here's a fun fact - they're the ones that helped make my business cards come to life! And that's a wrap! As you can tell, I'm a sucker for all things stationery, and my love for these cards (and brands) know no bounds. To see the NSS16 post from last year, click here.